Makeup is the key to a good zombie costume. Zombie costumes are a fun and creepy choice for Halloween, haunted house costumes and any time you want to scare someone. 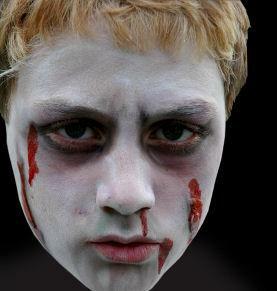 Because zombies to some extent look just like everyone else, they can also make a quick, easy and relatively inexpensive costume for your event. Zombies are basically just people who have come back from the dead, so the clothing part of the costume is not all that important. You can wear anything from a suit to your regular clothes, just make sure you get them a little dirty and tear them up to give you that fresh from the grave look. You can even bury your clothes for a week or two before the party so they'll get nicely muddied and maybe even a little decomposed. Or you can use brown paint to "muddy" your clothes. The most important part of a zombie costume is the makeup. It's important to have that unearthly look so people will know you're not just dressed in ripped up clothes. Bruises, blood, a green or black pallor to the skin and even exposed bones can make your zombie look more authentic. Zombie Maker also has some good tutorials. If you don't want to mess up your own clothes, you can buy zombie costumes at most costume shops. They usually consist of some kind of ripped up clothes, often a scraggly wig and exposed bones. Some costumes have different themes such as a zombie doctor or a zombie groom. For most people, being a zombie is all about getting to make your own costume, and it's really quite easy to devise your own gear to wear. If you don't want to mess up any of your own clothes, it's time for a visit to the thrift store. Odds are good you'll be able to find a cheap suit (probably made of polyester and maybe in a size larger than you are) that you won't feel too bad about messing up. Of course, once the zombies attack there will be living dead who have never been buried, so you can take another costume and make it zombie. This is a great way to recycle a costume you might have worn a previous year but haven't yet gotten rid of. You could be a zombie cheerleader, zombie prom queen, zombie bride or groom, zombie bowler, or just about any other kind of character you can think of. Being a zombie brain surgeon is surely a unique idea that no one else at the party is likely to consider. Once you've picked your clothes, they need to get a little messed up. Run around in the yard and get grass and mud stains on them, rip them a little bit (keep them wearable but ragged) and splatter a little blood on them. If you want, give your zombie a backstory. When and how was he or she turned? Why are you wearing what you're wearing? Do you have an interesting injury and why? This adds a fun flavor to your costume and can give you ideas for makeup and accessories. Zombie costumes are a lot of fun and dressing like one of the undead gives you a lot of leeway to be creative while you're being scary.